Wood pens two entertaining short stories about facing fears and God’s protection. Even at the youngest ages, our children can develop a personal relationship with [God]. Through the pages of her new book, Monsters and Angels (Monsters in My Closet and Snow Angel), ($10.99, paperback, 9781498416344; $5.99, e-book, 9781498416351) Rose Wood’s sincere hope is to teach children that they can take their fears and questions to God. She demonstrates, within her book, that God is always present. The text is filled with wisdom and topics for discussion between parents and children. It teaches that the supernatural world is real, that angels are real, and that we can turn to Jesus in our scariest moments or with any questions. Rose Wood has personal and professional experience with children. Her educational background includes a B.A. of Sociology from Mercy College of Detroit, graduate studies at Wayne State University, and a certificate in writing for children at the Institute of Children’s Literature. She is a retired medical social worker. The author also has a solid background in ecumenical religious education. Xulon Press, a division of Salem Communications, is the world’s largest Christian self-publisher, with more than 12,000 titles published to date. 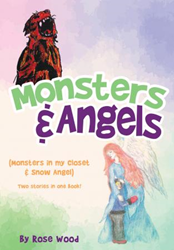 Retailers may order Monsters and Angels (Monsters in My Closet and Snow Angel) through Ingram Book Company and/or Spring Arbor Book Distributors. The book is available online through xulonpress.com/bookstore, amazon.com, and barnesandnoble.com.